The Amazon Kindle line will soon disappear from Target's shelves. NEW YORK (CNNMoney) -- Target will soon stop selling the Amazon Kindle line of e-readers and tablets, the retailer confirmed Wednesday. Target representative Molly Snyder said the company, which began carrying the Kindle in its physical stores nearly two years ago, is "phasing out Kindles and Amazon- and Kindle-branded products in the spring of 2012." Tech blog The Verge was the first to report the news, citing a leaked internal Target memo. 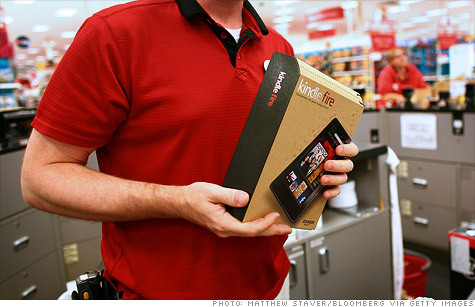 Target (TGT, Fortune 500) declined to comment on the specific date that Kindles will disappear from its shelves. The Verge's memo pegged May 13 as the last day for Kindle shipments to Target stores. Target would not comment on the reason for the Kindle's elimination, saying only "we typically don't discuss our relationships with vendor partners." Amazon (AMZN, Fortune 500) did not immediately reply to a request for comment. The Kindle was an apparent hit for Target: The company said last year that the just-launched Kindle Fire was Target's bestselling tablet on Black Friday. Target will still sell other e-readers, including the Barnes and Noble (BKS, Fortune 500) Nook, Snyder said. Target recently signed on to sell Amazon's chief tablet rival: the Apple (AAPL, Fortune 500) iPad. It plans to roll out Apple "mini-stores" in 25 of its store locations to sell iPads and iPhones. But plenty of other retailers, including Best Buy (BBY, Fortune 500) and Wal-Mart (WMT, Fortune 500), sell both Kindles and iPads. The webpage for Target's Kindle-branded online store was empty on Wednesday, a fact that generated much chatter online. But Target rep Snyder noted that Kindles were never for sale on Target.com -- customers could only view the e-readers online. Actually buying one from Target required a trip to a brick-and-mortar store.